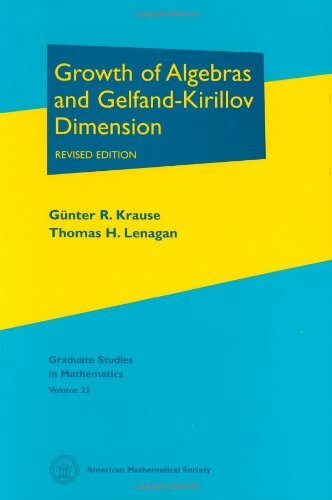 [PDF] Growth of Algebras and Gelfand-Kirillov Dimension (Graduate Studies in Mathematics) | Free eBooks Download - EBOOKEE! Description: During the two decades that preceded the publication of the first edition of this book, the Gelfand-Kirillov dimension had emerged as a very useful and powerful tool for investigating non-commutative algebras. At that time, the basic ideas and results were scattered throughout various journal articles. The first edition of this book provided a much-needed reliable and coherent single source of information. Since that time, the book has become the standard reference source for researchers. For this edition, the authors incorporated the original text with only minor modifications. Errors have been corrected, items have been rephrased, and more mathematical expressions have been displayed for the purpose of clarity. The newly added Chapter 12 provides broad overviews of the new developments that have surfaced in the last few years, with references to the literature for details. The bibliography has been updated and accordingly, almost double the size of the original one. The faithful revision and contemporary design of this work offers time-honored expertise with modern functionality. A keenly appealing combination. So, whether for the classroom, the well-tended mathematical books collection, or the research desk, this book holds unprecedented relevance. No comments for "[PDF] Growth of Algebras and Gelfand-Kirillov Dimension (Graduate Studies in Mathematics)".